When he takes office next week, President-elect Donald Trump will inherit an array of global threats in the view of the public. About eight-in-ten Americans (79%) say ISIS poses a major threat to the well-being of the United States, and 71% say the same about cyberattacks from other countries. Nearly two-thirds (64%) view North Korea’s nuclear program as a major threat, while comparable shares regard the power and influence of Russia (54%) and of China (52%) as major threats. About half (52%) say global climate change represents a major threat, and 46% say the same about the large number of refugees leaving Iraq and Syria. Over the same period, the share of the public describing the refugee movement from countries such as Iraq and Syria as a major threat to the United States has declined nine percentage points (from 55% to 46%). 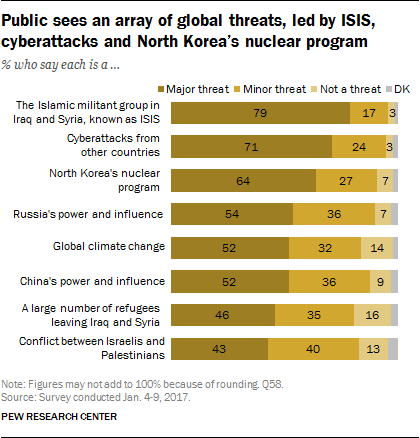 There are substantial partisan differences in perceptions of most global threats. As in the past, the biggest divide by far is over the threat presented by global climate change. Nearly eight-in-ten (77%) Democrats and Democratic-leaning independents say global climate change is a major threat to the well-being of the United States, compared with only 25% of Republicans and Republican leaners. By contrast, Republicans are about twice as likely as Democrats to say the large number of refugees leaving Iraq and Syria is a major threat to the U.S. (63% vs. 30%). The largest change in partisan views of global threats is seen in assessments of Russia. Currently, Democrats are 26 percentage points more likely than Republicans to say Russia’s power and influence is a major threat to the well-being of the United States (67% vs. 41%). The survey finds only modest partisan differences in views of the threat from the conflict between Israel and the Palestinians. But the gap in Mideast sympathies – for either Israel or the Palestinians – now stands at its widest point in surveys dating to 1978. A partisan gap is seen in other attitudes about the Mideast conflict as well: Most Democrats (60%) say a way can be found for Israel and an independent Palestinian state to peacefully co-exist. Republicans are much more skeptical: 44% say a peaceful two-state solution is possible, while 49% say it is not. And Israeli Prime Minister Benjamin Netanyahu continues to be popular with Republicans – and unpopular with Democrats. 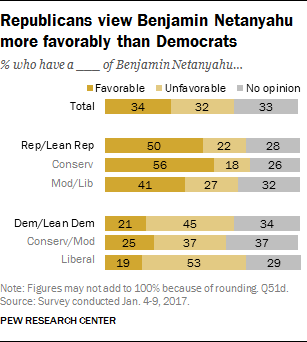 Half of Republicans and Republican leaners have a favorable impression of Netanyahu, compared with 22% who have an unfavorable view (28% do not offer an opinion). Among Democrats and Democratic leaners, opinions are nearly the reverse: 21% view Netanyahu favorably, while 45% have an unfavorable opinion and 34% do not express a view. The survey finds that the United Nations – which along with Israel has been a focal point of political debate since the election – is viewed positively by the public. Currently, 62% view the United Nations favorably, while only half as many (31%) have an unfavorable opinion. That marks little change from last year (64% favorable, 29% unfavorable). Democrats (81% favorable) continue to be far more likely than Republicans (44%) to have a positive impression of the UN. Overall, 54% say that Russia’s power and influence is a major threat to the U.S. This is as high a share viewing Russia as a major threat to the U.S. in Pew Research surveys since 2005 (the wording used in surveys to describe Russia has varied with events over the past 12 years – see topline for full details). More now see Russia as a major threat than in April 2016, when 42% said “tensions with Russia” presented a major threat to the U.S. Concern is about as high as it was in August 2014, when 53% described “growing tension between Russia and its neighbors” as a major threat to the U.S. (the 2014 survey was conducted in the months after Russia annexed Crimea). The increase over the last year in the share viewing Russia as a major threat has been driven entirely by shifts in views among Democrats; and for the first time in surveys since 2005, more Democrats than Republicans see Russia as a major threat to the U.S. 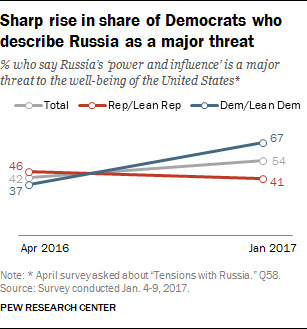 Two-thirds (67%) of Democrats and Democratic leaners say Russia’s power and influence is a major threat to the U.S., up dramatically from April 2016 when just 37% viewed tensions with Russia as a major threat. 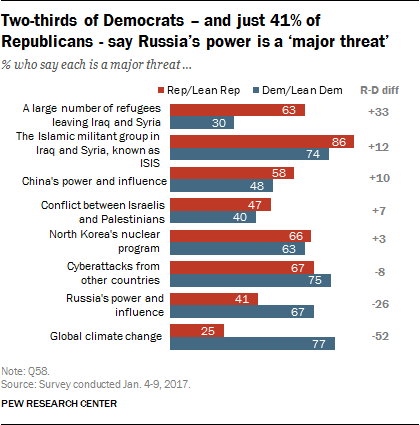 By contrast, 41% of Republicans and Republican leaners now see Russia as a major threat, little changed from the share who said this in April (46%). In the wake of reporting that Russia was involved in hacking the Democratic National Committee and the Clinton campaign in last year’s election, concern about cyberattacks has increased among Democrats, while it has decreased among Republicans. 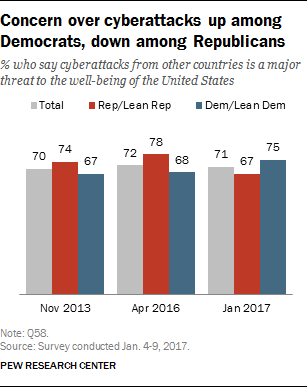 In the current survey, a larger majority of Democrats and Democratic leaners (75%) than Republicans and Republican leaners (67%) say cyberattacks from other countries are a major threat to the U.S. In April 2016, partisan views were the reverse: 78% of Republicans viewed cyberattacks as a major threat compared with 68% of Democrats. Differences over the seriousness of global threats facing the United States are even more pronounced when looking at ideology and partisanship. For instance, 88% of liberal Democrats regard global climate change as a major threat to the United States, making it the top threat among eight included. By contrast, just 18% of conservative Republicans say global climate change is a major threat, which is 21 percentage points lower than the next lowest threat, Russia’s power and influence (39%). 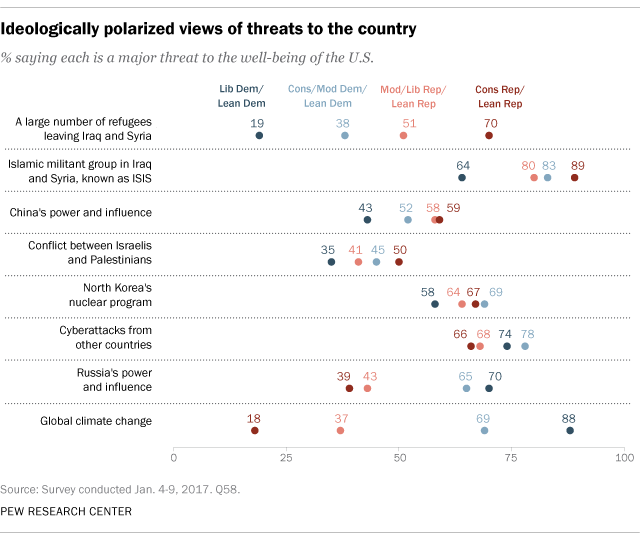 Conservative Republicans are roughly four times as likely as liberal Democrats to view the large number of refugees from Iraq and Syria as a major threat (70% vs. 19%). For conservative Republicans, the refugee migration ranks behind only ISIS (89% major threat) among global concerns. Among liberal Democrats, refugees are by far the lowest rated threat. For the first time in Pew Research Center surveys, Democrats are about as likely to say they sympathize more with the Palestinians (31%) than with Israel (33%); 11% say they sympathize with neither, while 8% sympathize with both and 17% do not offer an opinion. The share of Democrats who say they sympathize more with Israel is down 10 points from April 2016. The share who say they sympathize more with the Palestinians is little changed from last April (29%), but is up significantly from July 2014 when just 17% said they sympathized more with the Palestinians. By contrast, Republicans continue to overwhelmingly say they sympathize more with Israel (74%) than the Palestinians (11%). 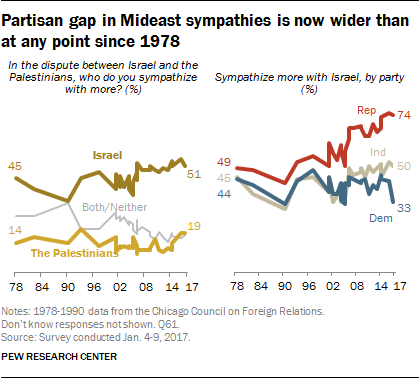 There has been little movement in views among Republicans in recent years, but the share who say they sympathize more with Israel is now higher than in the mid-2000s and prior. For example, in 2005, 57% of Republicans said they sympathized more with Israel in their dispute with the Palestinians. 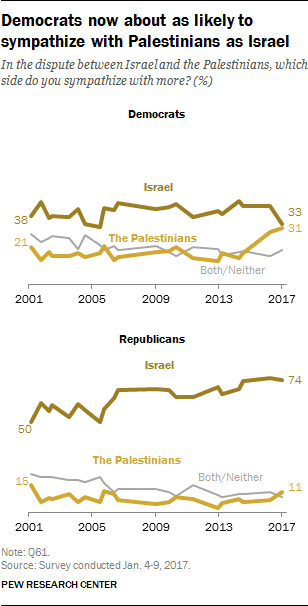 As a result of these trends, there is now a 41-point gap between the shares of Republicans (74%) and Democrats (33%) who say they sympathize more with Israel. This is the largest party gap in views on this question in surveys dating to 1978. Nearly eight-in-ten (78%) conservative Republicans say they sympathize more with Israel than the Palestinians. A somewhat smaller majority of moderate and liberal Republicans (64%) also sympathizes more with Israel. Across age groups, young adults are much more optimistic on this question than older adults: 65% of those ages 18-29 think a way can be found for Israel and an independent Palestinian state to peacefully coexist; about half of older adults say the same. Among Republicans, roughly as many say a way can (44%) as cannot (49%) be found for Israel and an independent Palestinian state to coexist. There is a wide divide among Republicans by ideology. By 56% to 42%, moderate and liberal Republicans think a two-state solution is possible. Among conservative Republicans, more say they do not think this is possible (53%) than say it is (39%). Most Democrats (60%) think there’s a way for Israel and an independent Palestinians state to peacefully coexist (32% do not think so). There are no divides by ideology among Democrats. Views on a possible two-state solution are tied to Middle East sympathies. Among those who sympathize more with Israel, 49% think a peaceful two-state solution is possible, while 46% do not think this is possible. Among those who sympathize more with the Palestinians, 67% think a way can be found for Israel and an independent Palestinians state to peacefully coexist; just 29% do not think this is possible. By a two-to-one margin, Americans continue to have a positive view of the United Nations. Currently, 62% express a favorable opinion of the UN, while 31% hold an unfavorable view. The public’s views of the UN have been fairly stable in recent years. Partisans are divided in their opinions. Roughly eight-in-ten Democrats (81%) hold a positive opinion but less than half of Republicans (44%) say the same. 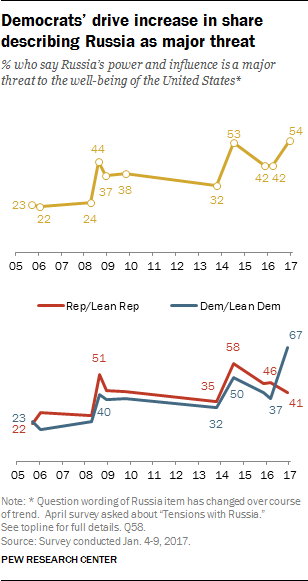 This partisan gap is not new, however. With few exceptions, Democrats have been more positive than the GOP about the United Nations going back to 1990. A majority of independents (61%) express a favorable view of the UN, while fewer (32%) hold an unfavorable opinion. The public continues to view China as a serious problem, but not an adversary. A plurality of Americans say they view China as a serious problem (43%), while smaller shares say China is not a problem for the U.S. (31%) or consider it an adversary (22%). These views are little changed in recent years. There are minor partisan differences in opinions of China. Republicans and Republican-leaning independents are somewhat more likely than Democrats and leaners to consider China an adversary. About a quarter of Republicans (26%) rate China as an adversary, compared with a smaller share of Democrats (17%). Roughly a third of Democrats don’t consider China a problem (34%) along with 27% of Republicans. There are age and ideological divisions within the GOP. Younger (ages 18-49) and moderate and liberal Republicans are less likely than older (ages 50 and older) and conservatives to view China in adversarial terms. By a nearly three-to-one margin (41% to 14%), younger Republicans are more likely than older Republicans to say that China does not pose a problem to the U.S. About a third of moderates and liberals (35%) also say this, compared with fewer conservatives (22%). Age differences among Democrats are more modest. 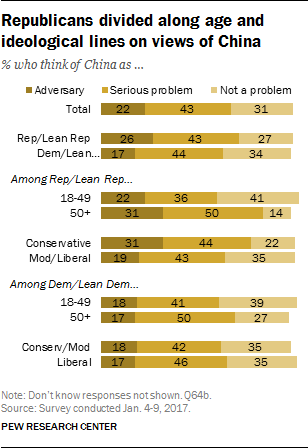 Younger Democrats are somewhat more likely to say China does not pose a problem to the United States (39%) than older Dems (27%). There are no ideological differences in views of China among Democrats. The public holds very different views of three world leaders: Vladimir Putin, Benjamin Netanyahu and Angela Merkel. 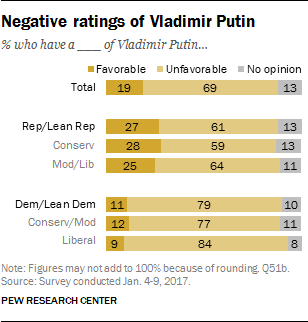 By 69% to 19% more hold an unfavorable than favorable view of Russian President Vladimir Putin; just 13% do not offer a rating of him. Views of Israel Prime Minister Benjamin Netanyahu are mixed: 34% view him favorably, while about as many (32%) view him unfavorably and 33% are unable to offer a rating. German Chancellor Angela Merkel is not well known to the public: 48% do not offer a rating of her; 29% view her favorably, while 23% view her unfavorably. There are significant differences by party and ideology in views of all three leaders, however views of Netanyahu are the most polarized. By 50% to 22%, more Republicans and Republican leaners view Netanyahu favorably than unfavorably (28% do not offer a rating). Views are especially positive among conservative Republicans. Among Democrats and Democratic leaners, more view Netanyahu unfavorably (45%) than favorably (21%), while 34% cannot rate him. Liberal Democrats hold more negative views of Netanyahu than conservative and moderate Democrats. Nearly eight-in-ten (79%) Democrats and Democratic leaners hold an unfavorable view of Putin, compared with a smaller majority of Republicans and Republican leaners (61%). Over the last two years, favorable ratings of Putin have increased among Republicans, while unfavorable ratings of him have gone up among Democrats. (For more, see: “U.S. public sees Russian role in campaign hacking, but is divided over new sanctions,” released Jan. 10, 2017). Angela Merkel is held in higher esteem by Democrats than Republicans. Overall, 38% of Democrats and Democratic leaners view her favorably, while 18% view her unfavorably and 44% are unable to rate her. Among Republicans and Republican leaners, 31% hold an unfavorable view of the German chancellor, compared with 22% who have a favorable view and 47% who do not offer a rating.